A literary-musical event titled "Glorious life pages" dedicated to the 75th anniversary of prominent orientalist, Honored Scientist, Presidential Scholar, academician Vasim Mammadaliyev has been held today at the Scientists House of ANAS. Opening the event with participation of prominent figures of science, culture and religion, President of ANAS, academician Akif Alizade talked about the meaningful life of the prominent scientist, rich scientific-pedagogical and public activity. He said that all the life and activities of V.Mammadaliyev served to enrich the spirituality of our people, and the head of ANAS noted that scientist's scientific searches are widely used in Arabic linguistics and general linguistics, Islamic studies. "V. Mammadaliyev is one of the initiators of propagating scientific study of Islamic religion in Azerbaijan, underlined president of ANAS. Then Deputy Chairman of the Caucasian Muslims Office Fuad Nurullayevemphasized scientist's contribution to the study of science, scientific knowledge of the Islamic religion, as one of the major researchers of the Arabic language. Saying that more than 30 books by V.Mammadaliyev were published, F. Nurullayev especially mentioned the scientist's work "The Guran and Science". He said that this valuable work is a valuable source for every Muslim. V.Mammadaliyev is a prominent scientist who has reached a high level of science with his intellect, intelligence and deep thought. He is the follower of Mirza Kazim Bey tradition, the most worthy successor of the Oriental studies of Azerbaijan, whose roots went to the depths of the Middle Ages, academician Govhar Bakhshaliyeva, director of the Institute of Oriental Studies stated. 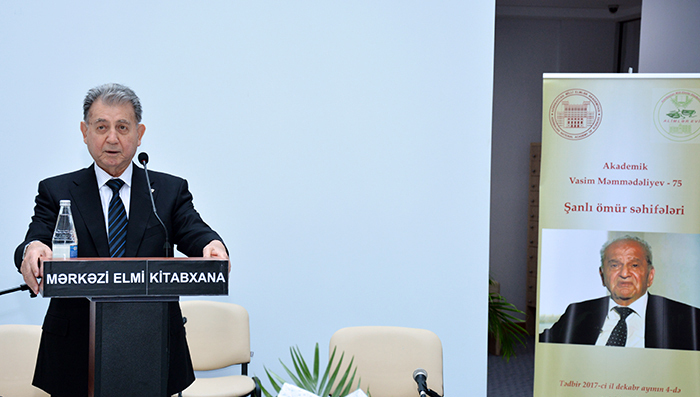 Vice-President of ANAS, academician Isa Habibbayli, shared his valuable opinions about the scientist; spoke about the outstanding scientist's activities in the field of theology science in Azerbaijan and the study of the Islamic religion in the field of science. The vice-president of the National Academy of Sciences of Azerbaijan emphasized that V.Mammadaliyev was systematically investigating Arabian grammar schools for the first time, the scientist's services have always been highly appreciated by our state. He was awarded the highest state awards, "Glory", "Honor". The rector of the Baku State University, academician Abel Maharramov spoke about the pedagogical activity of academician V. Mammadaliyev. The theology faculty led by the academician has played an important role in the preparation of well-educated specialists in theology and Islamic studies in our country, as well as the Holy Koran, translated into Azerbaijani by V.Mammadaliyev with the late academician Ziya Bunyadov, in our country, strongly influencing the study of Islam, its history, philosophy and culture, he underlined. Director of the Institute of Petrochemical Processes, academician Vagif Abbasovspoke about the exceptional services of Mammadaliyev in the development of oriental sciences in Azerbaijan and in the development of scientific cadres in this field. At the end,Vasim Mammadaliyev thanked the participants of the event for their great attention and care. Then the event continued with an artistic part.